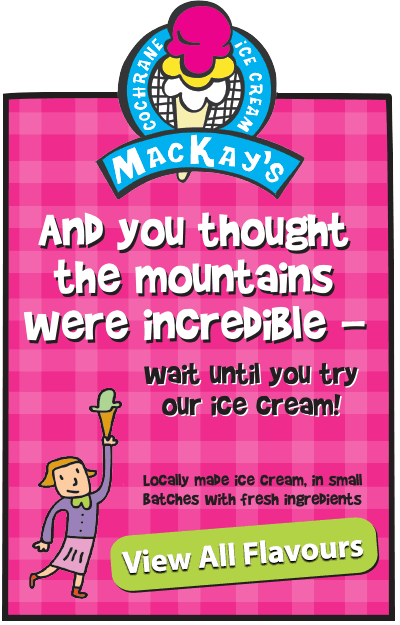 MacKay's Ice Cream FAQs - Your Top Questions About Our Ice Cream! 1. Are you open today? At MacKay’s we understand weekends, evenings, and holidays are some of the best times for family gatherings and adventures – and we love being part of that! We are open every day of the year, with the exception of Christmas Day, Boxing Day & New Year’s Day. Our hours do vary between winter and summer – please check our contact us page for current hours. 2. Is your Ice Cream made with Gluten? Our ice cream base DOES NOT contain gluten, however, specific flavours have added ingredients which contain gluten such as cookie dough pieces, fudge brownie pieces, cookies, etc. If you’d like to check for gluten in a scrumptious favourite or a bold new choice, we have product ingredient lists available for all of our ice cream flavours. When requesting your ICE CREAM, remember to ask for a dish OR GLUTEN FREE CONE. 3. What are your most popular flavours? We have 2 top flavour lists: “ice cream by the scoop” and “take home flavours”. The lists are very different! 4. Is your ICE CREAM handmade? Yes. The addition and mixing of the ingredients is done by hand. However, we do need a little help from electricity to run our freezer. Despite living in an era and culture of automation and mass production, we still choose to do as much as possible with human hands on a small scale because we know that it improves the quality of the ICE CREAM. We make each batch only 2 tubs at a time (think pail, not bathtub) in our batch ICE CREAM machines. In the first stage, we mix the high butterfat Western Canadian cream with the flavours and then partially freeze it. This combination is then poured into the tubs where the ripples and candies/nuts are added by hand. The completed blend is then put in a blast freezer for 24 hours. One scoop of MacKay’s ICE CREAM embodies the core values of the company. From production to pleasure our philosophy is rooted in ensuring quality. The Alberta small town, entrepreneurial spirit meets superior local and global ingredients to make world renowned ICE CREAM. We pay attention to detail throughout production. We whip in less air during manufacturing than most other ICE CREAM producers. The result? A denser ICE CREAM with a smoother, creamier texture. There is literally more ICE CREAM and less air in every mouthful. Each flavor is created from a rich palette of ingredients which always starts with fresh 100% Western Canadian cream. This cream is 16-18% butterfat and makes our ICE CREAM an amazingly creamy super-premium experience. For comparison, most other ICE CREAM is made using 10-12% butterfat. Some manufactures use buttermilk or substitute cheaper tropical fats such as palm oil. Our quest for quality also includes our choice of other ingredients – such as sweet Alberta Haskap berries, responsibly sourced cocoa, decadent butterscotch marble, and fresh bananas and avocados. The entire delightful process, is carefully monitored by our Quality Assurance Specialists. You don’t need to be a connoisseur to tell the difference!